Templo IPositioned perfectly in the centre of the Mayan territories, which stretched from the Yucatan Peninsula down to El Salvador, Tikal is believed to have dominated the entire region throughout the Classic Period, from 200AD to 800AD. At its zenith, the city spanned 16km2 and is thought to have been home to a population of around 90,000 people. 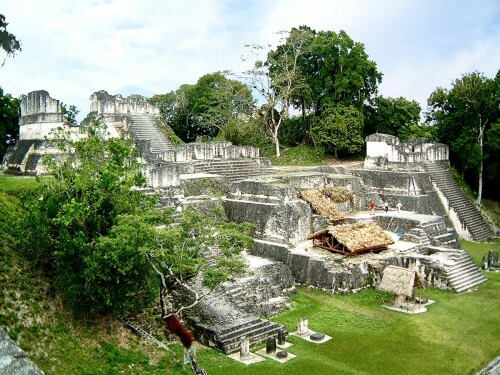 As a city-state, Tikal’s administrative district covered 120km2 and was home to as many as 425,000 people – a very large population for the time. Fig. W0856: North AcropolisTikal features a huge number of stelae, engraved altars and inscriptions, which detail many of the important events that took place in Tikal’s long and illustrious history. These encoded monuments have provided historians with a lot of information about Tikal, its neighbours, alliances, wars and rulers. 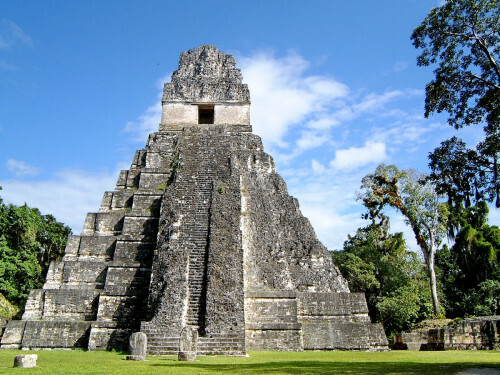 Tikal buried their great rulers within the massive Temples around the city, in particular those of the North Acropolis. The burials were marked with stelae to indicate who they were, who their parents were, when they reigned and when they died. This has provided historians with an accurate list of rulers from 90AD through to 869 AD. 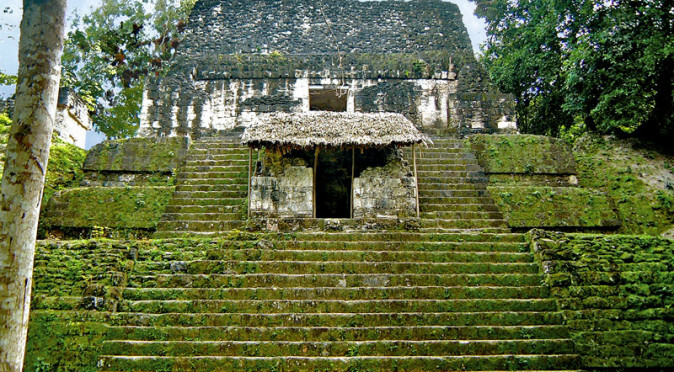 The first signs of occupation at Tikal date as far back as 1000BC in a period known as the Middle Preclassic. However, monumental building at Tikal began in around 400BC with the erection of temples around the North Acropolis (fig. W0856). Much of what you see at the archaeological park of Tikal today was built in the Classic and Late Classic period over the earlier structures in a ritual regeneration process that most Mesoamerican cultures employed. Fig. W0821: Temple 5C-49,TikalThe first defining event within Tikal’s history seems to be an intervention or defeat at the hands of Teotihuacan in 378AD. With the city of Teotihuacan located amongst the high plains of the Valley of Mexico some 1000km away, it seems unlikely that their attention would be drawn to the Mayan jungles, but Stela 31 at Tikal talks of a “Lord of the West” arriving under the name of Siyah K’ak’ (Fire is Born) and features a non-Mayan glyph of an owl being speared in a style that many people associate with Teotihuacan. 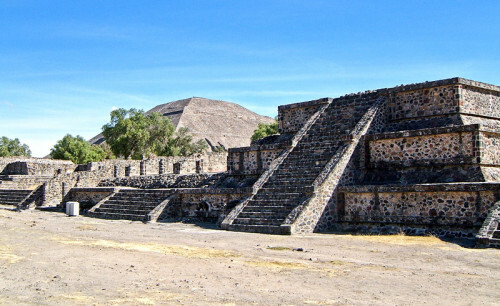 Further evidence of a Teotihuacan influence is found in the Talud-Tablero Temple, Structure 5D-47, within the the Mundo Perdido complex. 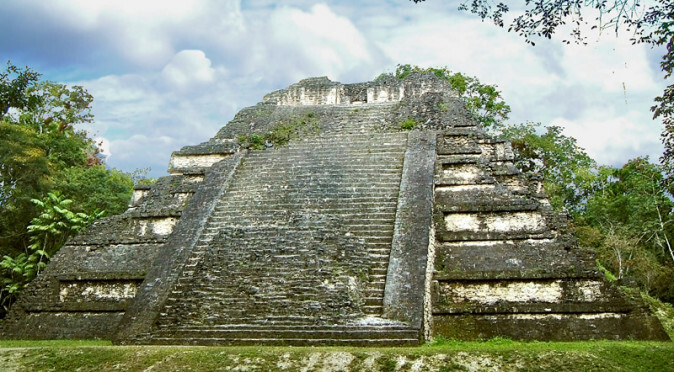 This temple dates to sometime between 300AD and 550AD and is the only temple at Tikal to employ this distinctively Teotihuacan style of construction, with alternating layers of steeply sloping walls (taluds) and vertical walls (tableros) (see fig. W0016 & fig. W0821). It would seem most likely that the relationship was born from a trading rather than conflict. Teotihuacan was the most powerful civilisation in Mesoamerica at the time with an extensive trade network and may have seen Tikal as the ideal base for trading with the Maya, especially those farther south. 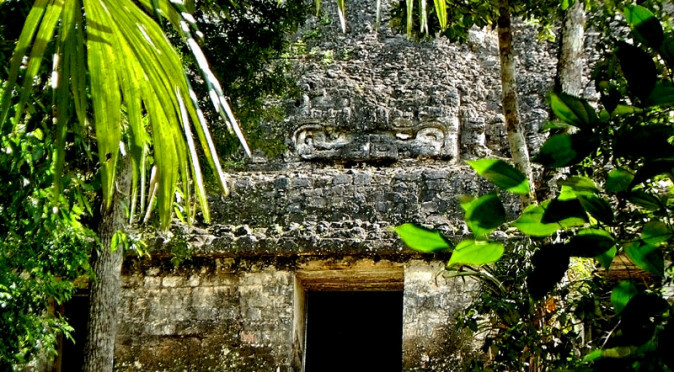 The appearance of Siyah K’ak’ coincided with the death of the Chak Tok Ich’aak (Great Jaguar Paw) who was ruler of Tikal, and it is thought that Siyah K’ak’ presided over the appointment Nun Yax Ahiin as the subsequent ruler of Tikal. Therefore, it may well be that Teotihuacan wanted to install a leader who was receptive to trade and would give the Teotihuacan an area of the city, seemingly the Mundo Perdido, from which they could base their trading operations. 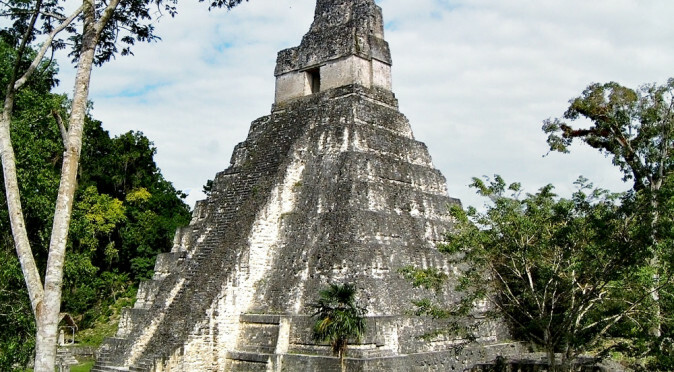 In 426AD, evidence suggests that Tikal expanded south and were responsible for founding the city of Copan (in modern day Honduras), installing K’inich Yax K’uk’ Mo as its ruler. 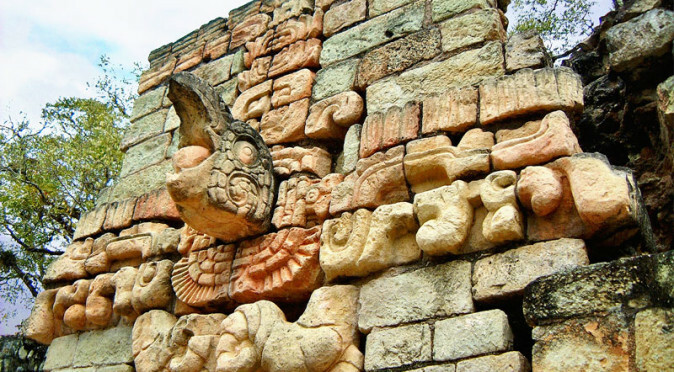 Copan founded the city of Quirigua later that year, and through these two cities Tikal was able to dominate the southern regions. The expansion also appears to have been influenced by Teotihuacan as much of the iconography of Teotihuacan was passed through to Copan, including the Rain God Tlaloc. 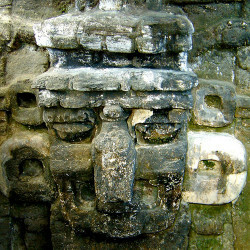 Tlaloc is quite easily identifiable, with his long nose, large eyes, and huge ears, and his effigy has also been uncovered on the second phase of construction of Tikal’s Temple 33 which dates to the late 5th century, not long after the intervention of Teotihuacan. 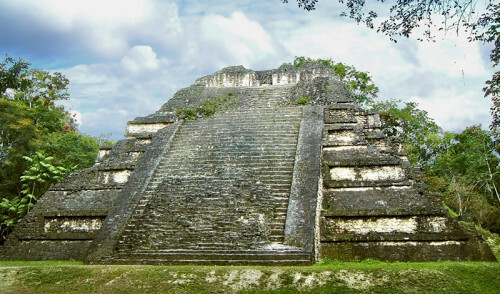 In the 6th century, a long-term rivalry with Calakmul began, which climaxed with Calakmul striking an allegiance with Caracol who went on to defeat Tikal in 562AD. A 120 year period of silence ensued at Tikal, known as the “Tikal haitus”, with a notable absence of stelae and inscriptions. 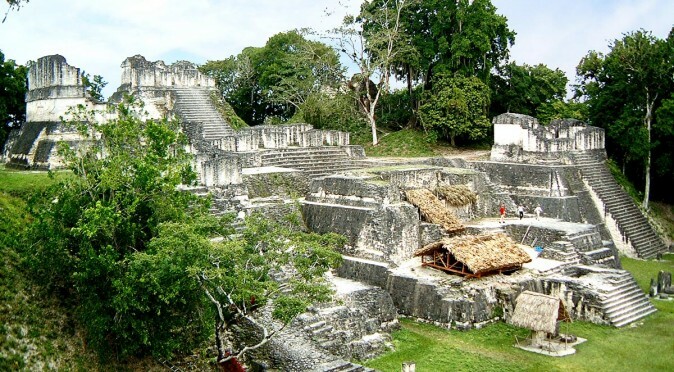 During this period Tikal was subdued whilst the Caracol grew rapidly and Calakmul thrived. 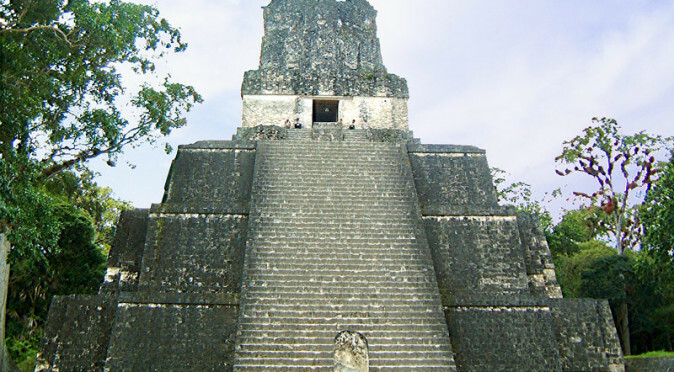 Tikal founded another city in 629AD known as “Dos Pilas”, from which it controlled the Pasion River. Dos Pilas was attacked and defeated by Calakmul in the mid 7th century, but the city’s ruler was re-instated as a vassal of Calakmul and was commanded to attack Tikal in 657AD, forcing Tikal’s ruler Nuun Ujol Chaak into exile. 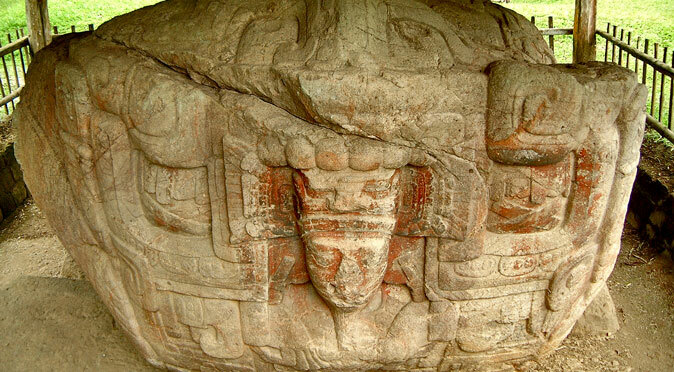 Calakmul then tried to dominate the region through allegiances with Dos Pilas, El Peru and Caracol. Fig. W0841 Templo IIn 682AD, Tikal finally broke the silence when Jasaw Chan K’awiil I erected a stelae pronouncing himself as kaloomte’, which is believed to mean “High King”. This title signified that he was the ruler of a Kingdom rather than the ruler of a city. Jasaw Chan K’awiil went on to build many impressive new monuments, none more so than his own funerary temple, Templo I, and that of his wife, Templo II. 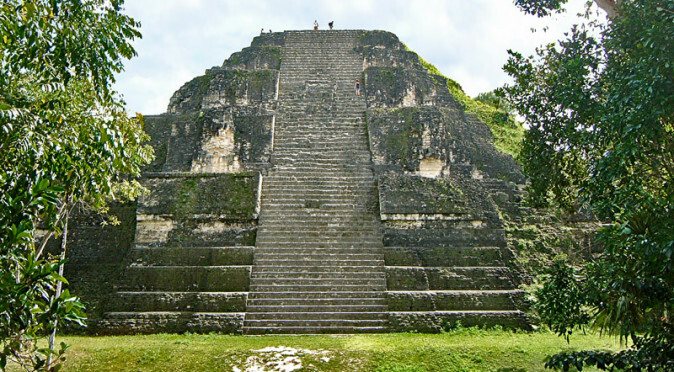 In 695AD, Jasaw Chan K’awiil led Tikal to victory against Calakmul, managing to capture their ruler and begin the enemy state’s steady decline. His son, Yik’in Chan K’awiil, then took over in 734AD. Yik’in Chan K’awiil was also a master builder, in fact he was probably more prolific than his father, and is responsible for many of the monuments that still stand at Tikal today. He is firstly accredited with finishing Templo I, his father’s mortuary temple (fig. W0841); he then rebuilt Templo II as part of the reburial celebration of his mother who was buried within; he then built his own palace, known as Grupo G or the Acanalanduras Palace (see fig. W0837); finally, he erected Templo IV and Templo VI and the causeways that lead to them – now known as the Tozzer and Mendez causeways. Yik’in Chan K’awiil continued his father’s military renaissance and exerted further misery on Calakmul – defeating them in 736AD, and its allies, El Peru and Naranjo, in 743AD and 744AD. This signified the beginning of the end for Calakmul, but sadly Tikal was also running itself into the ground during it exploits as Tikal’s enormous population moved ever inwards to become better protected as the region became more unstable. 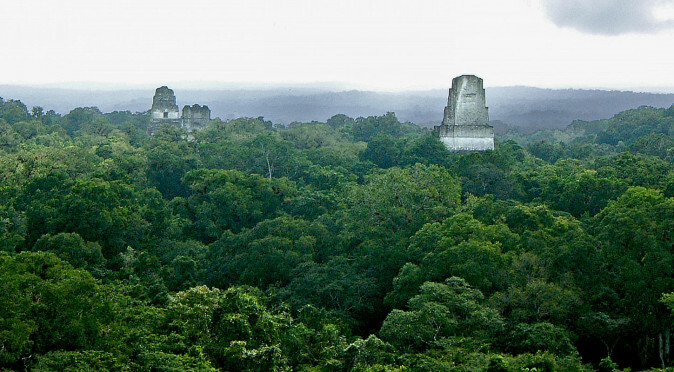 The result was that the land around Tikal was over worked and crops started to fail. This led to the belief that the Gods were abandoning the city and its rulers. 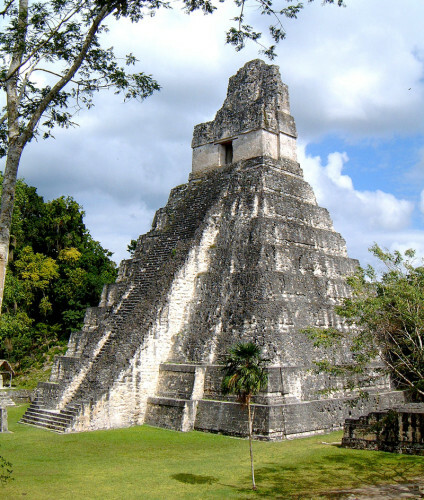 In the 8th century, Tikal’s rulers began to move the sacred stelae erected around the city into a single location in front of the North Acropolis – an area known as the Great Plaza. This was presumably a bid to harness the power of the ancestors and a desperate attempt to turn the city’s fortunes around. Unfortunately, it wasn’t the city that was in decline, but the whole area, as power shifted further north. Recent studies indicate that it may have been a drought that starved the city and its neighbours, which kick-started the demise of the city. By the 9th century the city was in rapid decline. Templo III was added, but that would be the last building to be built. In 869AD, a stela was erected by Jasaw Chan K’awiil II, but that would be the last monument of any type to be built. Tikal’s communities and satellite sites became fractious and started operating independently, with the great city powerless to intervene. By the end of the 10th century, the city was all but abandoned with squatters making use of the Royal Palaces and temples and erecting a shanty town in the Great Plaza. 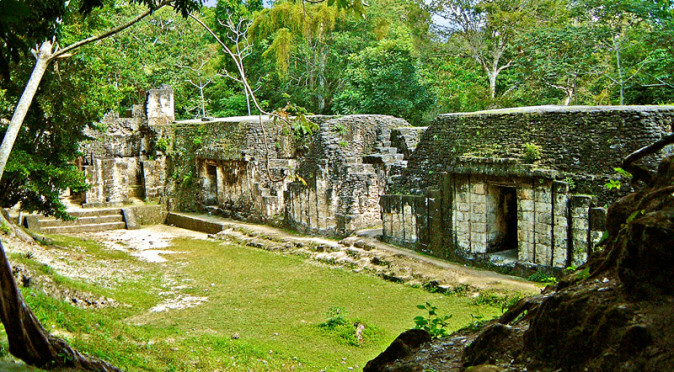 By 950AD, even these vagrants had abandoned the city and it was left to be reclaimed by the jungle until it was uncovered in the mid-19th century. The name Tikal means “at the waterhole”, a reference to the mighty reservoirs the city built to collect rainwater to supply the enormous population, which the locals continued to use long after the city was abandoned. An alternative theory is that it means “the place of voices” – a common name for places that locals believed were inhabited with the spirits of ancestors. Either way, it was a name given to it upon its rediscovery and the city knew itself as Mutal or Yax Mutal (meaning “first Mutal”). Tikal was first rediscovered in the mid-19th century, then famously photographed by Alfred P Maudesley in 1881-1882, again photographed and investigated by Teobert Maler in 1895, before archaeological investigation were undertaken by pioneers in the early 20th century. Most of the work on the site was undertaken in the ’60s by the University of Pennsylvania.